Parangtritis located 27 km south of Yogyakarta and easily accessible by public transport operation until at 17:00, (by bus) and private vehicles. 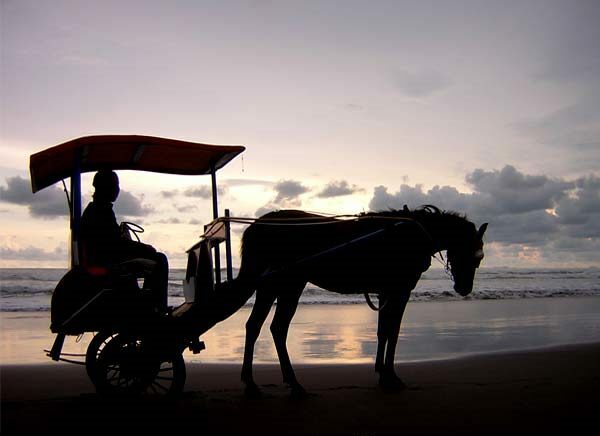 The afternoon before sunset is the best time to visit the most popular beach in Yogyakarta. But if you arrive more quickly, it could not hurt to go up to the cliffs behind the beach Gembirawati this. From there we could see the whole area Parangtritis, south sea, down to the horizon. There is a secret that not many people know, SStttt do not talk the way. Not many people know that on the east cliff is hidden a ruined temple. Unlike the other temples located in a mountainous area, Temple Gembirawati only a few hundred meters from the lip Parangtritis. To reach this temple, we can pass the ramp near the Hotel Queen of the South and then go down the path to the west about 100 meters. The faint roar of the ferocious waves of the sea could be heard south of this temple. Parangtritis very closely with the legendary Queen of South. Many people believe that Java is Parangtritis magical kingdom Queen of South gate which controls the southern ocean. Hotel Queen of the South is a luxurious resort that is named according to this legend. Unfortunately the resort is now open but rarely used to have a view that could make us breathless. When the sun is inclined to the west and the weather is sunny, it was time to have fun. Although visitors are prohibited from swimming, Parangtritis not lack the means to having fun. On the beach there are renting ATVs (All-terrain Vechile), the tariff is around Rp. 50000-100000 per half hour. Enter his gear and then release the clutch while pulling the gas. Brrrrooom, four-wheeled all-terrain bike will be raced take you across the sand dune beach. Well, ATVs may only be suitable for those who are more adventurous. Another option is the gig. Sand down the surface of a smooth wave washed with two-wheeled horse-drawn carriage is no less enjoyable. Hansom will bring us to the east end of the cluster of coral Parangtritis place so beautiful that spot is often used as a pre-wedding photo shoot. The dim twilight and shadow golden sun on the water surface more and evoke a romantic atmosphere. Parangtritis also offer excitement for those who travel with family. Kite-flying with your baby is equally enjoyable. Strong sea breeze which is very helpful to make a kite flying high, even if you have never played a kite though. Still reluctant to go home even though the sun had set? Soon some roasted corn sellers will hold a mat on the beach, we could hang out there until late at night. Still did not want to go home? Do not worry, Parangtritis available at dozens of flights and accommodation at an affordable price.